On my recent visit to the Maeght Foundation, in St. Paul de Vence, Provence, I encountered the exhibition “Arcadia in Celle / Art for Nature and Nature for Art.” It is a selection of one hundred artworks from the collection of the Italian contemporary art collector, Guiliano Gori, whose villa Celle’s park in Tuscany houses splendid outdoor installations. The exhibition is composed of paintings, sculptures, installations and drawings as well as architectural models, photos, videos and texts about various artists’ concepts and projects. 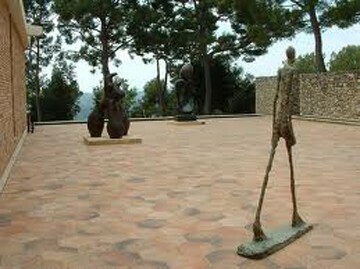 On this occasion, the Foundation in St. Paul de Vence, founded in 1964, is paying homage to this private collection by loaning its Alberto Giacometti’s Man Striding when it travels back in June to Celle. Guiliano Gori, 81 years old, made his fortune in the textile industry in the Prato region and began collecting after World War II. 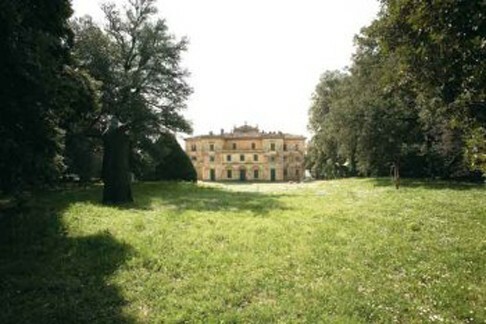 The collection occupies 20 hectares of land and more than 3000 square meters of buildings, visited, in part, by appointment. The collection is largely built by artists in-residence, invited by Mr. Gori and housed on the sumptuous, 17th century villa premises, with its English style park behind and surrounding fields. The visiting artists live the family life of their host, meeting regularly around the dinner table, sharing conversation and meals. Beside the outdoor installations the collection comprises paintings and sculptures of great masters of the twentieth century including: Giorgio de Chirico, René Magritte, Yves Klein, Hans Hartung, Henry Moore, Andy Warhol, Daniel Burren, Joan Miró and Anselm Keifer. While it features works from all over the world, it is also an opportunity to discover many Italian artists, more or less celebrated, such as Umberto Boccioni, Alberto Burri, Lucio Fontana, Osvaldo Licini, Marino Marini, Fausto Melotti, Luigi Mainolfi and Michelangelo Pistoletto. Mr. Gori is notorious for buying art in quantity – when he falls in love with the pieces and lives amidst them. Having known the Maeght family for decades, Mr. Gori is delighted to have part of his collection exhibited in France, saying, “Being a guest at the Maeght Foundation is like being a guest at the Vatican.” He is famous for giving artists complete free reign, as long as they do not intercept and telescope other artists’ work. He also is a silent viewer and listener of the artistic process. Mr. Gori is curious to see how contemporary artists might respond to a new kind of commission where space would become an integral part of the artwork and no longer used as a simple container for art. He enjoys watching how the existing environment is changed by the work of art into a new unit that invites the viewer to participate. He also has founded a creative laboratory that continuously produces and experiments with new vocabularies in various disciplines of art. The Maeght Foundation, in supporting Mr. Gori’s vision, honors the collection as one “in harmony with nature.” Adrien Maeght recognizes that his Foundation and the Gori Collection share similar philosophies, whereby “the artists are primordial to both of us.” As with the Celle’s park, the Maeght Foundation gardens are also about “a way of life and happiness,” says Isabel Maeght, the granddaughter of the founder, publisher and art dealer Aime Maeght. The villa’s Romantic ideal is replete with 19thcentury follies such as the Aviary, designed by the poet/architect Bartolomeo Sestini, the Tea House, the Egyptian Monument, and the two lakes with their bridges, crags and thundering waterfall. These creations seem to be prophetic forerunners of the installations of environmental, contemporary art – arte ambiante – that have been created in recent years. But, as it is impossible to identically replicate the Italian villa, with this extraordinary Romantic ideal of nature; visitors to the Foundation must use some imagination. To best replicate that spirit, the Maeght Foundation has devised a simulacra experience. 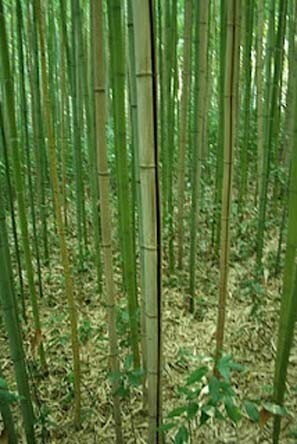 A narrow path leads through a bamboo forest to an anchored wooden boat. 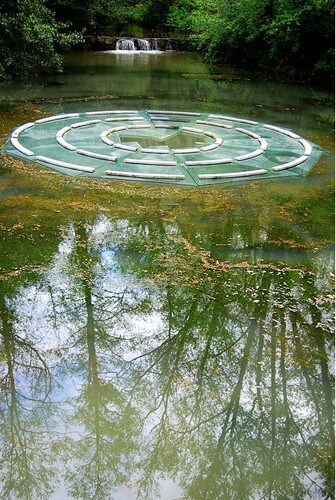 There, a glass cube is installed in the center of a field and a labyrinth awaits the visitor. 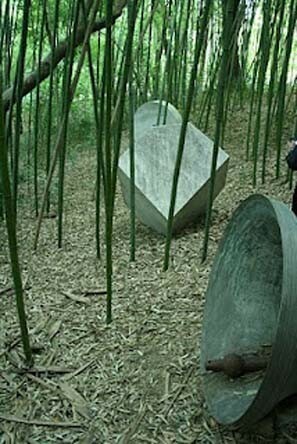 Oliver Kaeppelin, the new director of the Foundation, compares this installation, or discrete “open air laboratory,” to two other, more famous, open-air installation spaces, the Island of Naoshima, in Japan, and Centro di Arte Contemporânea Inhotim, in Brazil. Making the trip to the Maeght Foundation even more worthwhile, some of the indoor Villa Gori exhibition displays have traveled unchanged to St. Paul de Vence. 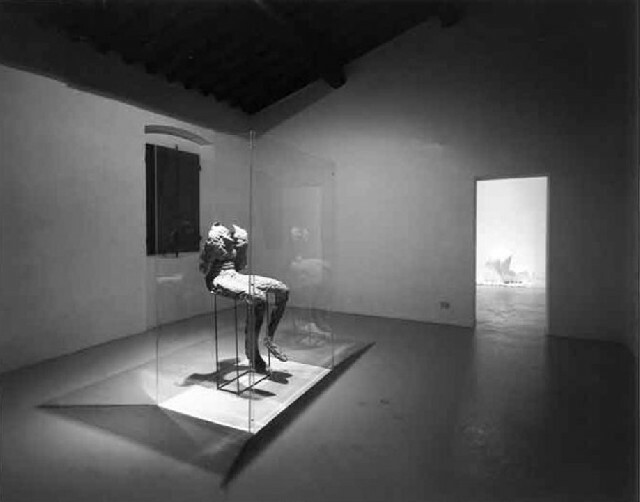 New creations by Robert Morris and Luigi Mainolfi, commissioned specifically for the Gori Collection, will be unveiled for its 30th anniversary on June 12, 2012. Also on display, are two works created exclusively for the Maeght Foundation, one by Alessandro Mendini and the other by Dani Karavan. 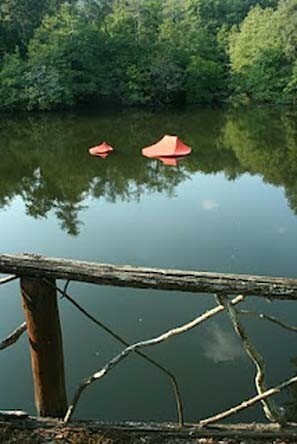 “Arcadia in Celle / Art for Nature and Nature for Art” is open daily until June 10, 2012. The exhibition will travel to Celle June 16, 2012 to focus on the installations in the park, accompanied by Giacometti’s Man Striding, borrowed by the Maeght Foundation itself.